Few things can put a damper on the joy of bringing a new puppy into your home than unwanted accidents. If you are looking for ways to housetrain your puppy, you are not alone. There are lots of ways to potty train your new puppy, and the good news is your puppy definitely wants to learn! Before you let your pooch get full run of the house, make sure to teach them the house rules and avoid accidents. Training a puppy to do tricks, to not chew up your things, and not to have accidents isn’t as difficult as it may feel. Yes, it can be a daunting task, but you can do it! Here are all the things you need to think about as you start housetraining your new puppy. For many, the thought of restricting a brand new puppy to a certain area of the house or a crate may feel awful. Hearing your pup cry out can definitely put your willpower to the test, but keeping your dog in a small enough area will quickly teach them not to relieve themselves inside. Confinement training is effective for a multitude of reasons. Your puppy will not want to relieve themselves in a small space they can’t leave. Crate or confinement training also helps keep your puppy safe. For example, if you are not home and let your puppy get free reign of the house, they could get into something toxic or get stuck somewhere. Eventually, with proper training, your pup will come to consider that space as their own, personal territory. It will be a safe place for them to retreat to when they feel overwhelmed or just want some peace and quiet. You may find them taking a nap there by choice before long, and they may even prefer it to your human furniture when looking for a resting spot. When you first start crate or confinement training your puppy, you may want to play with them as soon as you let them out. 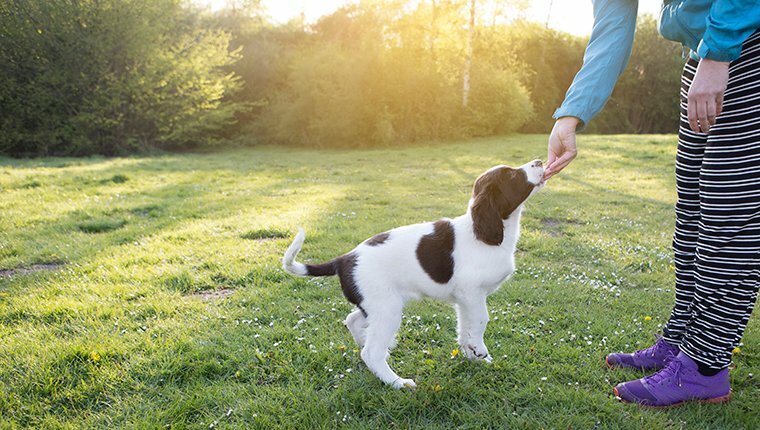 Before introducing your puppy to their new favorite toy, take them outside and have them relieve themselves. Use a command word, like “potty,” “outside,” or whatever works for you to signal to your puppy that it’s time to go out and relieve themselves. Even if you have a gated backyard, you should start with your puppy on a leash so they know it is time to eliminate and not to play. If you’re home with your puppy throughout the day, you should still keep them in either a doggy playpen or a crate unless you are able to keep all of your attention on them. Let your puppy out every one to two hours to make sure they aren’t sitting in their confined space with a full bladder or bowels. Keep some small treats on you whenever you let your puppy outside to go to the bathroom. Once they successfully eliminate, be sure to heavily praise and reward them. 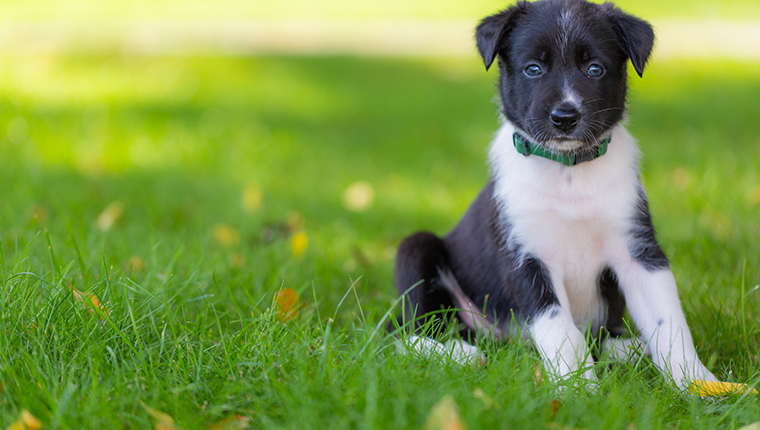 Your puppy will quickly associate the positive reinforcement they get with relieving themselves outside, and they’ll get the idea that they’re supposed to go potty there. If you leave your puppy in their crate and you return home to a soiled situation, resist the urge to shove your pup’s nose in it or yell at them. Your puppy will not associate the punishment with the act of soiling, as you did not catch them in the act. 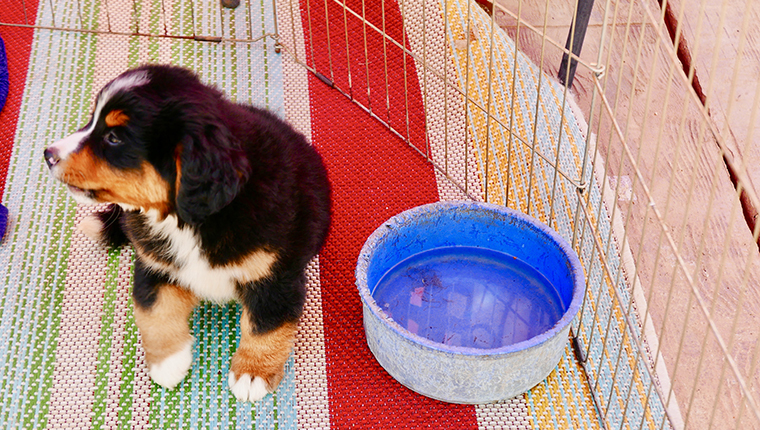 Yelling at your puppy could actually lead to the opposite effect of housetraining–they could start submissive urination to prove to you that they aren’t a threat. They could also develop neurotic behavior, like hiding or even eating their poop to avoid punishment. If you live in a five story walkup or you get a puppy when it is freezing cold outside, it may be difficult to let your puppy out every couple hours. 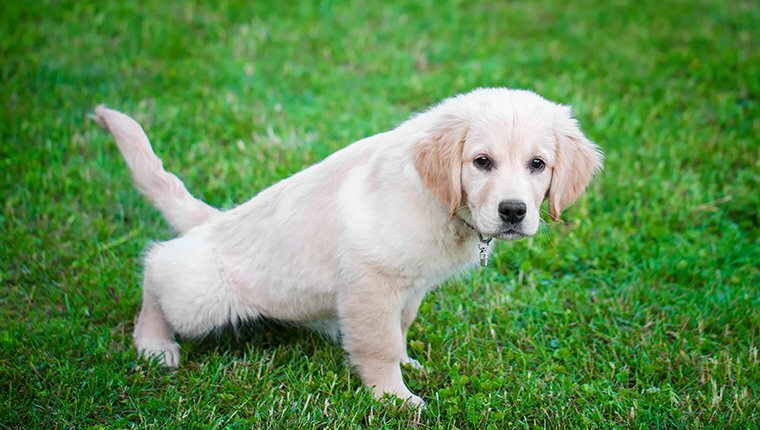 This doesn’t mean you can’t still successfully train your puppy how to relieve themselves outside. 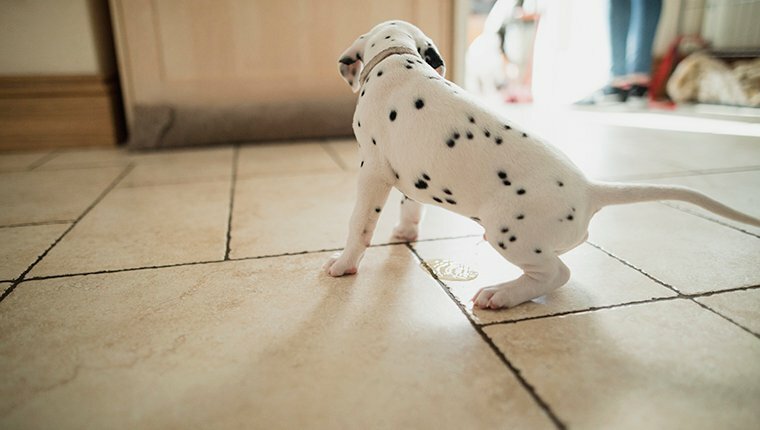 Set up a space–be it in a mudroom, in the corner of their playpen, or near the back door–that you can designate for your puppy to use the restroom. There are pee pads made of turf that can help your puppy transition from relieving themselves inside to doing so outside. Now, you won’t be able to magically dictate when your puppy falls asleep and wakes up, but in order to make sure your puppy is able to grow into a dog who can relieve themselves on your schedule, you’re going to want to set up a routine for your pup. For example, puppies usually need to urinate within half a minute or so of waking up. If you want to get some things done in the morning before walking your pup, perhaps they should sleep in their confined space–not in your room–so they don’t wake up as soon as you do. Conversely, many people find that walking their puppies first thing in the morning helps them from hitting the snooze button half a dozen times, so you may want your pup to sleep in the same room as you. It may take some trial and error, but you and your pup will find a groove in terms of relieving themselves in the proper manner. 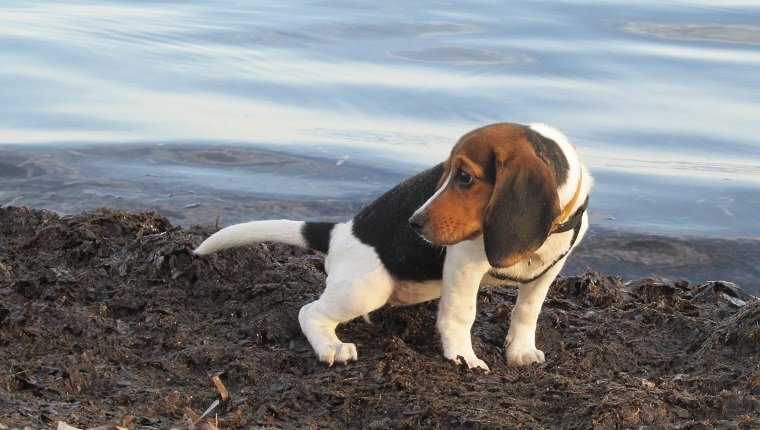 By taking your puppy out at the same times throughout the day–moreso at first, and then slowly weening them to every four to six hours instead of every hour–they will know when they can expect to go outside and relieve themselves. Dogs thrive on structure, and this will help stabilize your relationship with your puppy as well. Do you have any tips or tricks on how to housetrain a puppy? Any frustrations you encountered? Let us know in the comments.